I did a thing, and I was scared of it. 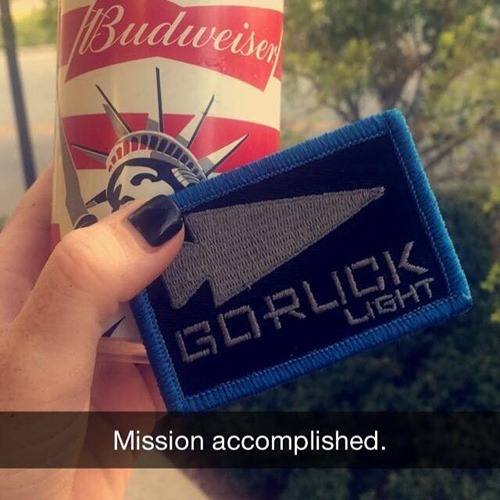 I’d heard of GORUCK for a while and was intrigued. I honestly wasn’t exactly sure what it was, but I knew it was a challenge I wanted to tackle. I’d seen a few blogs and knew I wanted to do one NOT near a beach. When I saw one was coming up in St. Augustine, so I decided to sign myself up! All I knew coming into the event was GORUCK encourages people to walk with weighted backpacks called rucksacks. GORUCK also offers team building events. A typical Light event last between 4-6 hours, sometimes 8. It all depends on your Cadre and what he feels like doing. You’re not permitted a watch. No phones. One of the first things you must do is get two bricks and wrap them with duct tape. I’d driven to a few places until I was able to find bricks. I posted this photo online and was immediately informed that the bricks must be solid without holes. Why? Because holes make them lighter. (Insert manly grunt) Picky, picky. I continued looking until I found two solid bricks and wrapped those. Other than that, there wasn’t much to do before race day except chat with my fellow participants in the Facebook event. Everyone is required to bring the two bricks, a backpack of some sort (preferably a rucksack or the bricks will shred it), your name and phone number written on the bricks (so you can’t toss them in the trash after), headlamp and water. Of course, I woke up that morning with a horrible pinched nerve in my back. I wasn’t even sure if I should be doing something like this, but I just couldn’t skip it. I’m glad I went. My back ended up not being an issue after all. I met the group in St. Augustine around Noon. I knew it was going to be an interesting day when I saw this in the parking garage. It’s not every day someone has a large inflatable boat in a parking garage, but I had an eerie feeling I was going to become very acquainted with this soon. What did we do with it? We carried it. Everywhere. All over St. Augustine. Along streets. Down alleyways. Across sidewalks. It took around 8 people to carry – 4 on each side. Considering everyone is a different height, it was challenging at some points. We started the day out with some drills. These involved us learning to follow directions and act quickly as a group. Sounds easy, but it can be challenging to get 46 people to coordinate and pay attention at the same time. If the group didn’t follow instructions, we did flutter kicks while holding our rucksacks in the air. If the group was too slow, we did flutter kicks while holding our rucksacks in the air. If the group talked too much, we did flutter kicks while holding our rucksacks in the air. If the group didn’t stay together, we did flutter kicks while holding our rucksacks in the air. We also practicing carrying the boats back and forth so everyone knew how to pick it up, set it down and maneuver it to ensure no one got hurt. Then we took off to explore St. Augustine from the underside of a boat. It was a nice, warm sunny day so there were lots of people out and about. We carried them to a small sandy beach (near where that super tall cross is) where we practiced crawling in the sand and some other movements. We also practiced a partner drag. This was super awkward and I could have done without this part. That’s also kinda what GORUCK is about. Getting comfortable doing things you don’t want to do. We then carried the boats to the Castillo de San Marcos Fort which was packed with people. Here we set down the boats, and our Cadres had us climb into the water. (So much for avoiding the water…) There we sang very loudly a Taylor Swift song. We’d been told to memorize the lyrics to the song earlier in the week. People were staring and curious as to what we were doing. Finally around 6:30 pm (I think? We weren’t allowed to wear watches or bring phones. Yes, I survived several hours without my phone…), we finished. Everyone helped unpack and breakdown the boats. We enjoyed some Budweisers and celebrated a successful day. Would I do it again? In a heartbeat! It was a fun challenging day. Oh, and I skipped over some details… because part of what makes a GORUCK event great is the unknown. Cheers! Huge thank you to GORUCK for taking a few photos of our day.